SDSI is growing steadily and therefore we’re looking for new staff! Read what it’s like working with us! SDSI has recently joined the LinkedIn network with our LinkedIn company page. In case you want to stay updated about our projects and other news, follow us! Our company ‘Van Dongen SDSI ‘ was launched in 1997. The SDSI brand stands for Support, Design, Styling and Illustration. 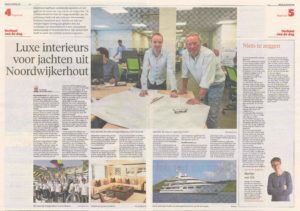 Founder Erik van Dongen’s education is in naval architecture. He started his career at Hoek Design in the early 1990’s. SDSI’s first assignment was a multi-disciplinary project that included sail plans, engine systems, deck arrangements, rigging configurations and interiors. SDSI’s services eventually evolved into specialized engineering for Super Yachts Interiors. SDSI has grown out to a full service interior yacht engineering studio. A dedicated crew of 16 professionals strives to excel in their job. An intensive week TSW training behind. 3-D engineering from design up to production. Meanwhile, the Feadship experts are busy with a ‘remote’ refit of the mighty Predator at a yard in the South of France. The project involves enhancing the accommodation capacity from six to ten on this 72.80-metre Feadship by adding two guest suites. The period will also be used to renew the galley equipment. All work is being managed and carried out by Feadship to ensure that Predator is prowling the world’s oceans again this summer season. SDSI has delivered its services in arrangement proposals and design visuals. Enthousiaste, leergierige stagiaires worden uitgenodigd contact op te nemen met Erik van Dongen of Barbara Rijnders. Kennis en ervaring in Autocad gecombineerd met een opleiding bij het HMC wordt geprefereerd.